This is my entry for the January Recipe Clippings blog event, read more about it on the Recipe Clippings page. 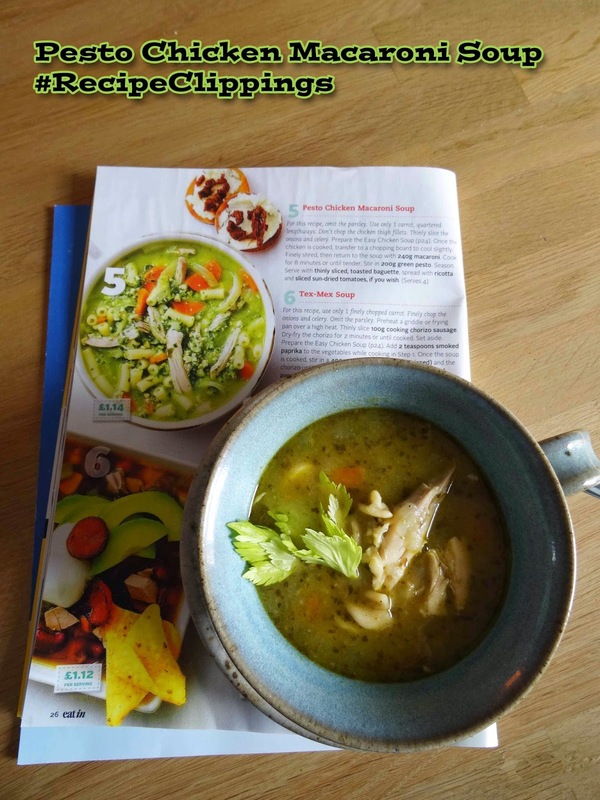 I haven't quite got round to cutting out this recipe for future reference, it's part of 10 ways with Chicken Soup in the February 'Eat In' magazine. There's a base soup recipe which you then change to make the different recipes, I chose to make the Pesto, Chicken, Macaroni Soup. I replaced the macaroni with wholewheat fusilli and reduced the amount of pesto by half otherwise no changes. 1. Heat the oil in a large saucepan over a high heat. Saute the onions, carrot, celery and potatoes for 5 minutes. 2. Stir in the chicken, stock cubes bay leaes and 1.5 ligres boiling water. Bring to the boil. Reduce the heat to low. Simmer, covered, skimming off any scum that rises to the surface, for 30 mintues or until the chicken and vegetables are cooked. Discard the bay leaves. 3. Remove the chicken to a chopping board and cool slightly, finely shred, then return to the soup with the macaroni. Cook for 8 minutes or until tender. Stir in the pesto. Season and serve. The soup was really filling and had a lovely flavour, it was ideal to take to work for lunch and is hearty enough to make an excellent main meal with lots of crusty bread. Warming and comforting chicken soup with a touch of pesto sunshine. Sounds like a fine combination to me. That looks gorgeous Janice, perfect for popping in a thermos on winters walk. Deelish!